EA Partners boss David DeMartini says that Valve is an "excellent partner" and hopes to be able to work with it on Portal 2. Pop quiz time: who's publishing Portal 2? What's that, you're not sure? Well don't worry about it too much; it was pretty much a trick question. As yet, no publisher has been announced for the game, but EA is in talks with the developer and is hoping that its previous relationship with Valve might tip the scales in its favor. EA Partners boss David DeMartini said that Valve was a very high-quality partner and demanded excellence from anyone it worked with. He said that you couldn't take a relationship with Valve for granted and that you had to earn its business each and every time. DeMartini was optimistic that EA's close relationship with the studio - it has published a number of Valve games in the past, including the Orange Box, and has links via Steam and through distribution ties - would give it an advantage. "I don't have anything signed in blood yet. I'm certainly working on it," he said. "They're a great partner and just a great studio. Clearly one of the best in the world. They just know what they're doing. They know what consumers want." It's hardly surprising that EA wants to publish Portal 2, as it's almost certainly going to be one of the biggest games of 2011, but it's interesting to learn that there's no standing agreement between the two companies. 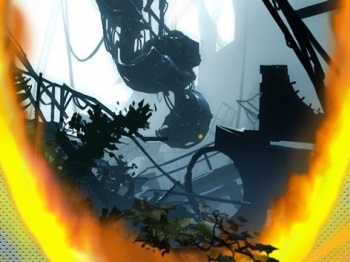 Portal 2 will be released on Xbox 360, PS3 and PC on February 9th, 2011.